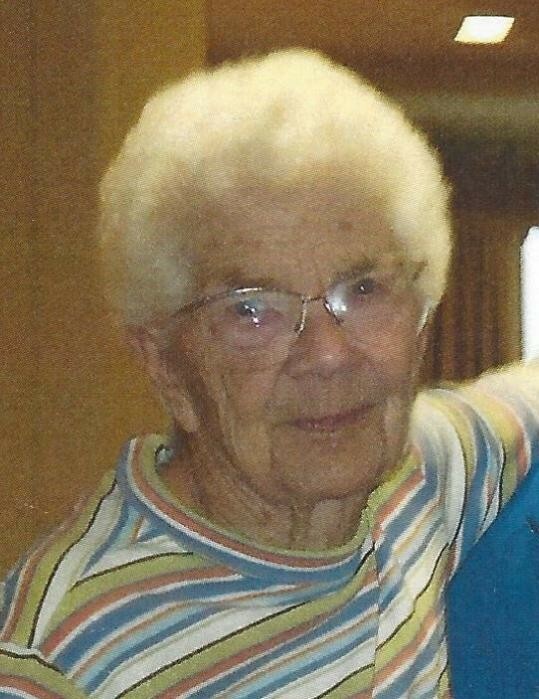 Fay Dollaway passed away peacefully at Meadow Brook on April 13. Fay was born in Lowell, MI in 1923 to Earl and Pearl (Zahm) Green. Fay lived in Lowell until she completed high school. She also attended the Muskegon Business College. While in high school, she met her future husband, Harold Dollaway When he joined the Navy, Fay joined him in San Diego where she worked as a true Rosie the Riveter. After the Navy, they settled in Muskegon where they built their home and raised their family. When their children got older, Fay entered the workforce. She worked at WKBZ Radio Station, Sears and the Department of Vocational Rehabilitation. In 1969, Harold and Fay purchased Johnson's Hardware in Mancelona and moved their family north. Together they operated the Ace Hardware until 1985 when they retired. Fay enjoyed the outdoors, made beautiful quilts, enjoyed playing the piano and harmonica, and reading. She loved picking berries and made the best pies! She also enjoyed traveling. Fay was preceded in death by her parents, husband Harold, brothers Jack and Doug and son-in-law ElDee McGill. She is survived by children Molly McGill, Kelly (Barb) Dollaway, Christa Gaugler, Carter (Jan) Dollaway, her sister Zoa Speerstra and several nieces and nephews. Fay had eight grandchildren, fourteen great grandchildren and two great-great grandchildren. No services are planned at this time. Online condolences may be expressed at www.mortensenfuneralhomes.com.